Using Taiwan's ICT industry advantages, the Internet of Things (IoT) will be used to stimulate industrial transition and upgrading and to build an R&D-based innovation and startup ecology that can link with core technology clusters around the world for the move into next-generation industries, and can form an Asia-Pacific developmental base for young innovators and entrepreneurs. (1) Promoting innovation and R & D in the IoT industry: This objective includes promoting the development of Internet of Things (IoT) application services through the strengthening of collaboration with Silicon Valley and other global innovation clusters; introducing international R & D initiatives in Taiwan and constructing value chains of the IoT through cross-disciplinary integration; and creating a demonstration area for diverse intelligent applications, developing smart transportation and smart medical applications, and advancing the development of IoT application services. (2) Creating a sound innovation and entrepreneurship ecosystem: This objective includes using innovation and entrepreneurship to drive economic growth by invigorating innovative talent, establishing comprehensive financial assistance, optimizing the regulatory environment, strengthening international links, and creating a sound innovation and entrepreneurship ecosystem. (3) Financing assistance to encourage bank loans for innovations in the 5+N industries. The amount of loans extended increased by US$10 billion from May 2016 to June 2017. Based on both the existing semiconductor and the communications industries, Taiwan is able to provide the hardware development, testing, manufacturing, and software that are needed by Internet of Things business operators for the development of their applications. Goods for IoT development tend primarily to utilize "small-volume large-variety production", for which Taiwan can provide international manufacturers with such features as fast delivery and highly customized products; the Small and Medium Enterprise Administration under the Ministry of Economic Affairs has also established the "Taiwan Rapid Innovation Prototyping League for Entrepreneurs" (TRIPLE) to provide quick testing plus high-value services for domestic and foreign innovative businesses with high-quality software and soft hardware integration as well as advanced manufacturing and management capability. Taiwan, with an average ICT service and network penetration rate of more than 80%, provides a complete infrastructure environment in which international manufacturers can achieve forward-looking networking applications. In 2017, five cities in Taiwan were appraised by the International ICF Forum as excellent smart cities, the second-largest number of cities of any country in the world. Taiwan's friendliest network environment and urban infrastructure for international businesses can speed up the implementation of IoT applications. Taiwan offers 78 co-working spaces for microenterprise entrepreneurs or freelance workers (Taipei Co-Space is one such example), seven public venture spaces (such as: TAF innovation base, the Taoyuan innovation R&D center), and 93 incubation centers to assist new business exchange, mentoring, and entrepreneur networking. (1) There are huge business opportunities in the IoT area. The market for IoT devices in 2020 will grow to US$20.8 billion and create a market of nearly US$3.4 trillion related to hardware and application spending, according to the international research and consultation company Gartner. 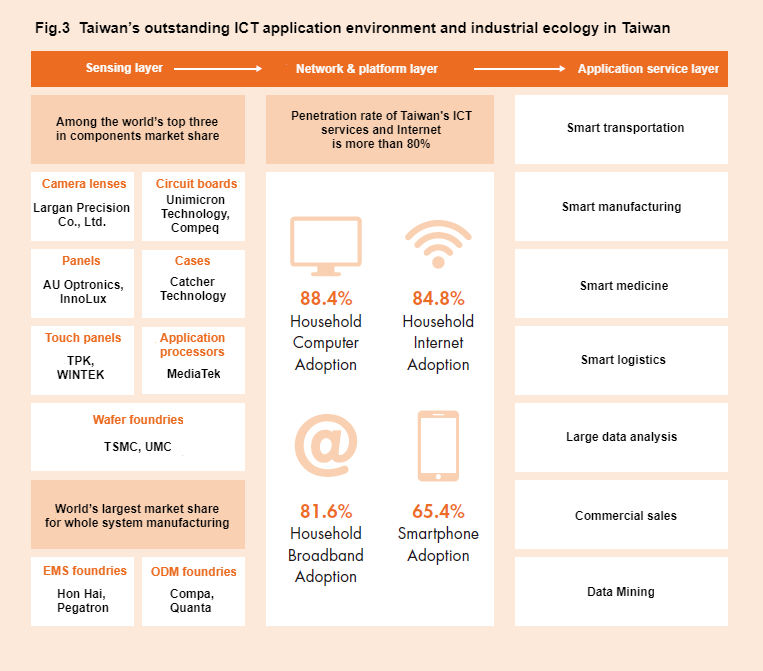 As Taiwan has a hardware manufacturing advantage in the ICT industry, foreign IoT companies can focus on innovative planning of technology development or operational models for entry into the international market through the industry's hardware manufacturing (small-volume large-variety production or mass production) as well as hardware and software integration for the joint creation of an IoT value chain. (2) For example, Sigfox, a well-known French networking company, has cooperated with Taiwan's Advantec, a company which produces IoT equipment for Sigfox devices so that Sigfox can devote its energies to expanding into the global market. In addition, Sigfox has linked up with Taiwan's IoT innovative initiatives and cooperated with various new companies and teams in Taiwan. (3) The domestic IoT industry and the start-up community have jointly formed the "Asian Silicon Valley Internet of Things Industry Alliance." Several international companies, including Cisco, Microsoft, and IBM, have already joined. Foreign businesses are welcome to join the alliance participate in exchanges and collaborate with domestic manufacturers to stimulate a new mode of cooperation. (1) Taiwan boasts a unique blend of highly-concentration and diversified industrial clusters, including semiconductor, electronics and petrochemical industry clusters; a broad range of industry knowledge, speedy certification and import services, strict attention to information security, and rich and innovative business resources. These qualities allow manufacturers to use Taiwan as an ideal test site for Asia-Pacific market penetration in terms of feasibility verification of smart logistics, smart medicine, intelligent power grids, intelligent transportation, intelligent manufacturing, intelligent energy, and other application systems prior to entering the greater China and Southeast Asian markets. (2) Using smart transportation as an example, unmanned buses built by a privately held passenger train operator from France, Easymile, have been introduced into a number of counties and cities in Taiwan to conduct field tests, and will be able to use their successful experience in Taiwan to facilitate their entry into other Asian markets in the future. Taiwan's local governments are actively promoting smart city applications, including smart government, smart health, smart environment and smart transportation. In addition, the Executive Yuan has launched a forward-looking infrastructure project - digital construction, in which the Ministry of Economic Affairs plans to invest US$200 million to promote universal smart applications for urban and rural living over three years from 2018 to 2020. From Apr, 2017, Taiwanese government plans to invest US$120 million to promote the "4G Smart City application & Service Program" in four years. (1) Taiwan has an excellent manufacturing spirit, exceptional technical talent and rich innovation, and a passionate entrepreneurial outlook. 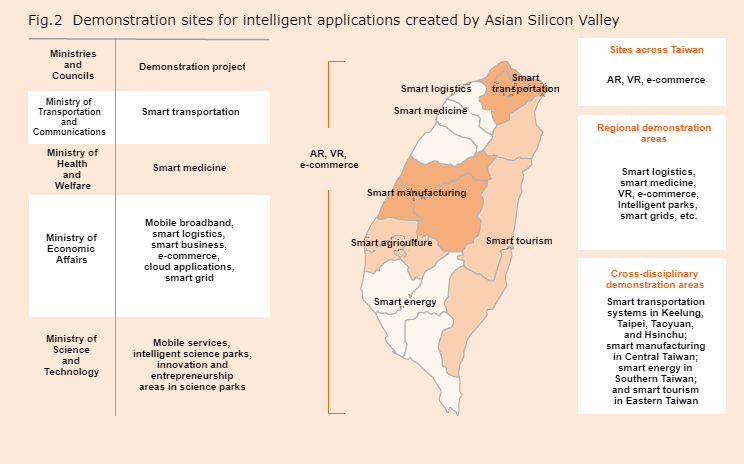 Foreign enterprises that come to Taiwan to set up innovative R&D centers will be able to tap into Taiwan's advantages to enhance their IoT innovation efforts and become part of an important hub connecting Asia-Pacific markets. (2) Specific areas include sensor technology and intelligent sensing modules, core and network technology for next-generation communication networks, and the hardware and software integration technology of IoT and cloud environments such as cloud management software and network virtualization technologies. (1) Business income tax rate in Taiwan is 17%. (2) Up to 15% of R&D expenses may be credited against the profit-seeking enterprise income tax payable by the company in the current year. (3) Imported machinery that is not yet manufactured domestically may enjoy tariff-free treatment. (4) Royalty payments to foreign companies for imported new production technologies or products that use patents, copyrights, or other special rights owned by foreign companies are, with the approval of the Ministry of Economic Affairs, exempt from the business income tax. (5) For operators stationed in Export Processing Zones, Science Parks and Free Trade Zones, imported raw materials, fuel, materials, semi-processed goods, and machinery may be exempt from import duty, commodity tax, and sales tax. The business tax rate in such areas is zero on goods and services shipped abroad. (1) Global Innovation and R&D Partnership Plan: Subsidies are available for up to 50% of total spending by foreign enterprises on the establishment of R&D centers in Taiwan. (2) Advanced Technology Research Plan: Subsidies are available for 40% to 50% of total development funding for new technologies that are not yet mature in Taiwan and that will, in the future, generate strategic products, services, or industries. (3) Integrated R&D Plan: Subsidies are available for 40% to 50% of total project cost for the integration of key and cross-sector technologies. 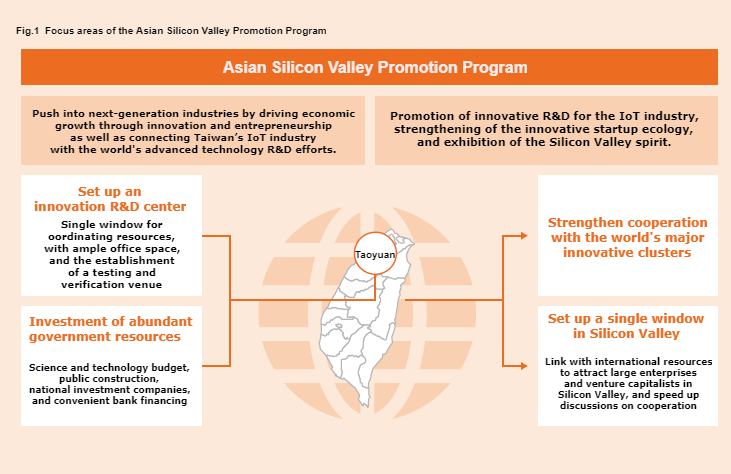 (4) Industrial Upgrading and Innovation Program: For companies having R&D teams in Taiwan, subsidies are available for 40%-50% of project funding for projects that conform to government programs and up to 40% of funding for projects generated by the applicants themselves. The IoT Innovation Center set up by the U.S. company Microsoft will establish a partnership with Taiwan to form an International IoT Team to compete for the global market; and an MOU signed by Qualcomm Corp. and the Ministry of Economic Affairs will see the setting up of a new technology laboratory in Taiwan to focus on the Internet of Things, 5G, and car networking technologies, helping domestic enterprises with technology development, service design, and product marketing, thereby jointly promoting the development of Asian Silicon Valley.